Skillful contract negotiation and management are vital to realizing a company's spend management and supplier performance goals. Here we explore how to negotiate better agreements with your suppliers, effectively manage contracts, and monitor compliance. Can you negotiate a good deal? Can you capture and document the agreement quickly, flexibly, and accurately, with a minimum of effort, error, and exposure? Can you monitor compliance to make sure that you are taking advantage of those hard-won gains? 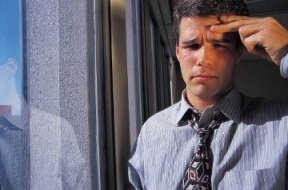 Imbalance of Power—Starting with negotiations, there is frequently a large imbalance of power, with a high-powered VP of sales executive negotiating with a low-level buyer. Lack of Spend Visibility—On top of that, the buyer may not have access to information about their company’s total spend, with this particular supplier, across all of the buyer’s divisions. Sheer Numbers of Contracts—Fortune 1000 corporations typically have 20,000 to 40,000 active contracts governing the majority of their business-to-business transactions. Compliance—Regulations such as Sarbanes-Oxley (SOX) and (for the Healthcare industry) HIPAA requirements mandate accuracy and compliance in these agreements, requiring disciplined processes and systems. “Leakage” / Non-conformance—After doing all the hard work of negotiating the best possible deal, crafting and recording the contract, many corporations fail to take advantage of those hard-won discounts for various reasons. For too many organizations, the answer is “no” to all of these questions. Too many firms still have untrained buyers and/or an undisciplined approach, paper contracts, manual processes, and fragmented systems. These problems make authoring contracts very time-consuming and error-prone, and compliance monitoring almost nonexistent (see sidebar “Negotiating and Managing Contracts Poses Many Challenges”). Firms that have made investments in buyer education and improving the full lifecycle of contract processes have realized benefits. We look at some of those practices here. A large high-tech manufacturer and systems integrator, which we will refer to here as “HighTech, Inc.” has implemented an “Advanced Negotiation Concept” program, incorporating components such as total cost analysis, game theory, market dynamics, and risk management. Total cost analysis is a key part of negotiations. Although buyers may be fully aware of the differences in material costs between suppliers, without total cost analysis they may not be aware of the value of other differences, such as lead times, on-time delivery, quality levels, perfect order rates, transportation costs, etc. Ideally, many of these total cost inputs will be based on the actual past performance of the supplier. That is the approach taken by HighTech, Inc. They integrated tools from multiple vendors into a system for managing contracts which they populate with KPIs (Key Performance Indicators) for their suppliers, by extracting actual supplier performance data from their ERP systems. Suppliers’ performance on past contracts feeds back into the negotiation process. These factors include a mix of quantitative and qualitative KPIs with different weighting. If a supplier puts in a bid for $100, and their on-time delivery performance has been 90%, this is factored in to adjust the total cost as part of the contract negotiations. Game theory is used by HighTech, Inc. to design negotiating strategies to meet specific goals, such as deciding whether suppliers can see the bids of the other suppliers. Anyone conducting reverse auctions or other types of bidding needs to understand the pros and cons of the numerous different options available to them in auction strategies and approaches. Suppliers have gotten increasingly sophisticated in their strategies as they’ve gained extensive experience participating in many auctions (see sidebar “Supplier Reverse Auction Tactics”). It behooves buyers to do their homework, remembering that they will have to live with the relationships they create out of these auctions, as well as the resulting appetite (or lack of it) for participation in future auctions by suppliers. Very few companies have a robust process to make sure that buyers are adequately trained in how to negotiate. Buyers can’t afford to fumble around trying to decide what tactic to use. This requires “saturation” training and memorization of the different tactics. After training, the challenge is to retain and integrate those negotiation skills into the business on a day-to-day basis. HighTech, Inc. sends buyers to a full two-day course and at the end provides them with a cheat-sheet: “Here’s what you need to know.” Then buyers are held accountable for applying the skills they’ve learned. They must fill out a worksheet before negotiating, to make sure that they are leveraging what they have learned. Armed with a combination of tools (e.g. total cost calculators), strategy, and training, the buyer has a fighting chance to negotiate better deals for the company. Once you’ve negotiated a good deal, you need to record it in a formal contract document. Companies that have not adopted a contract authoring system and repository spend an inordinate amount of time preparing, reviewing, and revising contracts—and then even more time retrieving them later, trying to find that one contract out of the tens of thousands they may already have on file. The resulting contracts lack consistency, even if Word templates are used. This can lead to legal exposure as well as make it difficult to monitor compliance. One of the major challenges companies face when automating contract writing is implementing the capability to enforce adherence to legal requirements, while retaining the flexibility to craft contracts that meet widely varying business requirements. HighTech, Inc. meets this challenge by using a contract configurator, which draws from a database of contract elements comprised of several hundred “chunks” of legally approved language. This allows flexibility in contract authoring, while accelerating the legal approval process. Based on terms in the contract, workflow software routes the contracts for electronic approval. Companies that significantly accelerate their contract authoring and approval processes gain another critical but less tangible benefit: business becomes faster and more agile. This becomes increasingly important as product lifecycles shrink and the pace of competition accelerates. A significant advantage is realized by developing the ability to quickly create new business relationships and craft contracts that effectively capture the important elements as well as protect both parties. The best deals in the world are useless if they are not monitored and leveraged to the fullest advantage. This is one of the most valuable features of a contract management system. Once a contract has been created and entered into a contract management system, the system can help buyers create purchase orders and monitor compliance. A major multi-national diversified industrial manufacturing company, which we will refer to here as “MultiManufacturing, Inc.,” puts pricing and terms information into their contract management system, which in turn feeds into each site’s MRP system. As a result, tactical POs are automatically populated with the negotiated pricing information, which helps contract compliance and saves buyers from having to wade through thousands of long-term contracts to find this information. In addition, MultiManufacturing, Inc. gets alerts on volume price breaks. They know which sites are using the contracts and can see the volumes coming in from each business. They are then able to use that information for spend analyses. 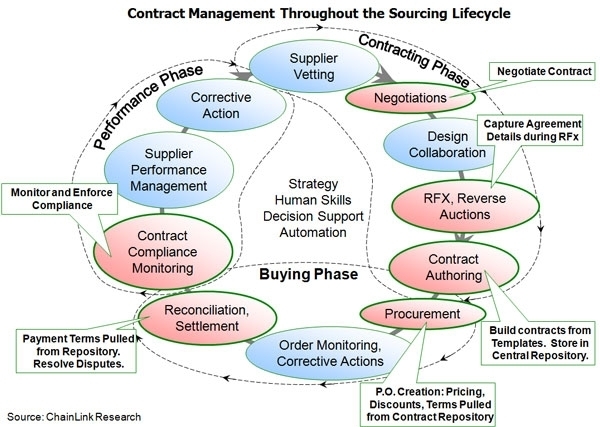 While the “Contracting Phase” is the first part of the sourcing lifecycle, the contract should be a living document, used throughout the buying and performance phases as well. Equipped with the right tools and training, sourcing and procurement personnel can not only negotiate and write good contracts, they can ensure the benefits of those efforts are reaped throughout the life of the contract.